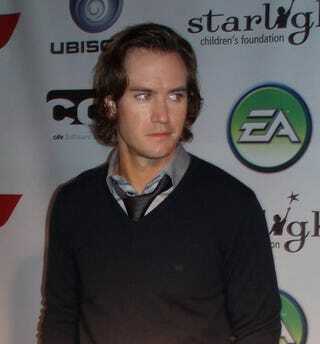 I had the distinct honor and pleasure of interviewing Mark-Paul Gosselaar at Nintendo's party Friday night. Of course we talked a lot about video games, from his personal favs to what he's looking forward to the most. He's quite the gamer, if you didn't know. Unsurprisingly, he's a big fan of music games, but he dropped this shocking announcement. The former front man of the legendary band Zack Attack is looking for a singer to complete his Rock Band group. He'd prefer a female, but describes that possibility turning into a stressful situation. "We need a singer." "Hopefully chicks, though." Although, I'm married and have been married for 12 years, that probably wouldn't work since we all play in our guest house." I was surprised when he said he was looking for a vocalist. I mean, besides being the lead singer in Zack Attack, he also headed The Five Aces, a semi-successful doo-wop group, and was a member of the men's glee club in high school, so I know he can sing. He said he plays drums now, almost exclusively, and that he's really, really good at them. Maybe he's trying to get revenge at a former classmate? So what's the name of his band? No, it's not what you think. "Orlando Profit." "It was one of those things where we were in a hurry and we didn't have time, so we just picked whatever default name came up. We took it. We're from Amsterdam and we're Orlando Profit." He also admitted to me that he was a big S.O.C.O.M. nerd, and in fact talked about how the first in the series was his all-time favorite game. He was disappointed they haven't been able to recreate the feel of the original, however. "I spent hours playing that game. I remember I was working on NYPD Blue, and I had to go to bed at a certain time and I had to be at work and I would get like three hours of sleep playing S.O.C.O.M. It just killed. Something about before all the glitchers came on, but the original S.O.C.O.M. for Playstation 2 just was a great format, was great to play online with your buddies, I don't know, it just hasn't been the same." While he said he doesn't have as much time to game as he used to, he has played a few other more recent titles, like Assassin's Creed and Call of Duty 4. I asked him if he was excited for LittleBigPlanet, but he told me he never heard of the game! He said "Thanks, brother" when I left. I'm not sure if he meant that genuinely, or if that's something he just says to everyone.